Pubblicata dall'etichetta Seeland Records fondata dai Negativland, Duke of Madness Motors è la collezione integrale delle performance radiofoniche degli esilaranti Firesign Theatre negli anni 1970-1972, presentate in formato mp3 per un totale di circa ottanta ore e illustrate in un libro di saggi, interviste, sceneggiature e materiali d'archivio: http://www.negativland.com/. 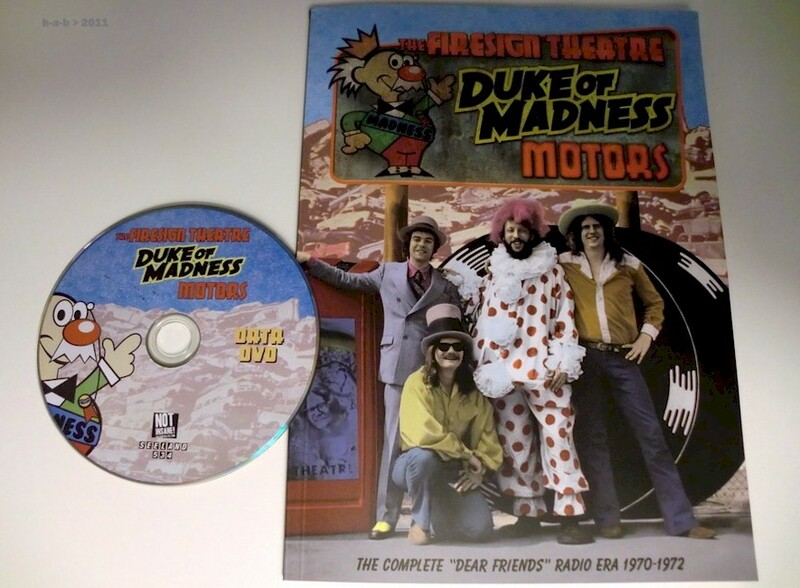 Duke of Madness Motors is one book and one data dvd, which together excavate, explicate, possibly extirpate, and definitely exculpate everything the Firesign Theatre did on the radio during their Dear Friends era. Inside you’ll find all the source material -- and all the background information -- on every radio broadcast Firesign Theatre did during the years 1970-1972: that’s every episode of the radio series The Firesign Theatre Radio Hour Hour, Dear Friends, and Let’s Eat, plus their one-off special Martian Space Party from March 1972 - from the original master tapes. The book is 7" wide by 10" high, full color, and contains everything you’d ever want to know about all of these shows, including complete rundowns, an 8000-word historical essay, new interviews with every member of Firesign plus their producer Bill McIntyre and engineer The Live Earl Jive, collages by Phil Proctor, vintage found objects, original scripts, and more. The DVD-ROM contains, in MP3 format, every original broadcast, completely restored and remastered -- 80 hours in all. That’s all 24 broadcasts of Radio Hour Hour, most of them never bootlegged and totally unheard since they originally aired; 21 episodes of Dear Friends, finally cleaned up from the archival master tapes after four decades on the cassette trading trail; the twelve Let’s Eat broadcasts from 1971-1972; and Martian Space Party, their 75-minute end-of-series barn-burner. 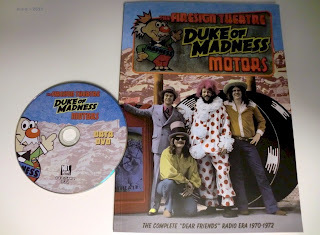 Truly a dream come true for Fireheads, Duke of Madness Motors is a celebration of surrealism, mind jamming, and good conversation from the guys who built the bus you Bozos rode in on. Could Firesign Theatre be the missing link in the evolution of Negativland’s Over the Edge...?